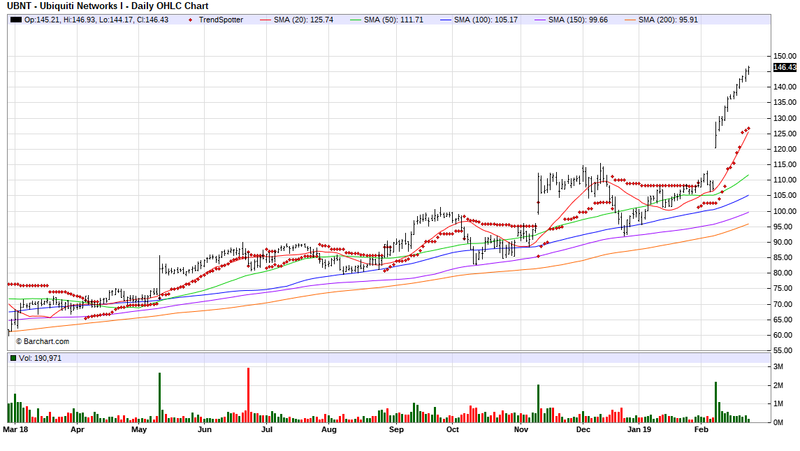 The Barchart Chart of the Day belongs to the wireless equipment company Ubiquiti Networks (UBNT). I found the stock by using the Barchart screener to screen for stock with at least a 40+ Weighted Alpha and Technical buy Signals of over 80%. That gave me a list of 202 stocks which I sorted for the most frequent number of new highs in the last month, then I used the Flipchart feature to review the charts for consistent price appreciation. Since the Trend Spotter signaled a buy on 2/1 the stock gained 33.62%. Ubiquiti Networks, Inc. is engaged in the business of designing, manufacturing and selling broadband wireless solutions worldwide. Its products and solutions include radios, antennas and management tools and other applications in the unlicensed radio frequency spectrum. Ubiquiti Networks, Inc. is headquartered in San Jose, California.